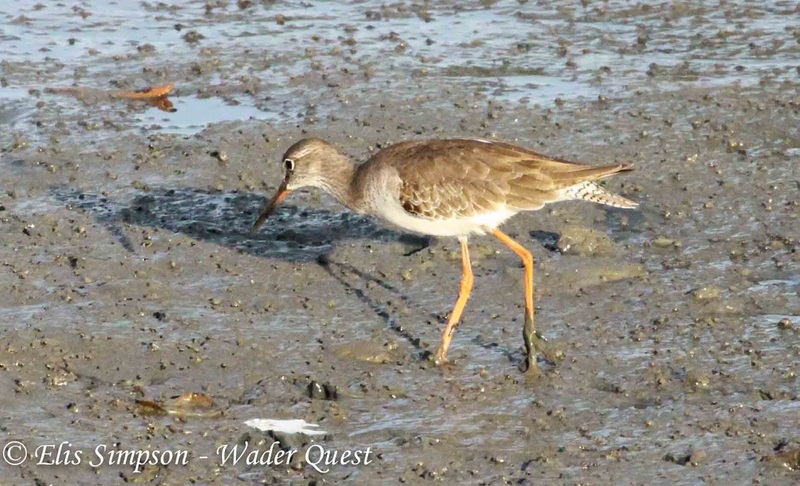 Wader Quest: Meet the 'shanks. Shanks come in two pairings, the Spotted Redshank and Common Redshank plus Nordmann's Greenshank and Common Greenshank. All but the Common Redshank occur in just one form or subspecies, the Common Redshank has six subspecies recognised around the world. 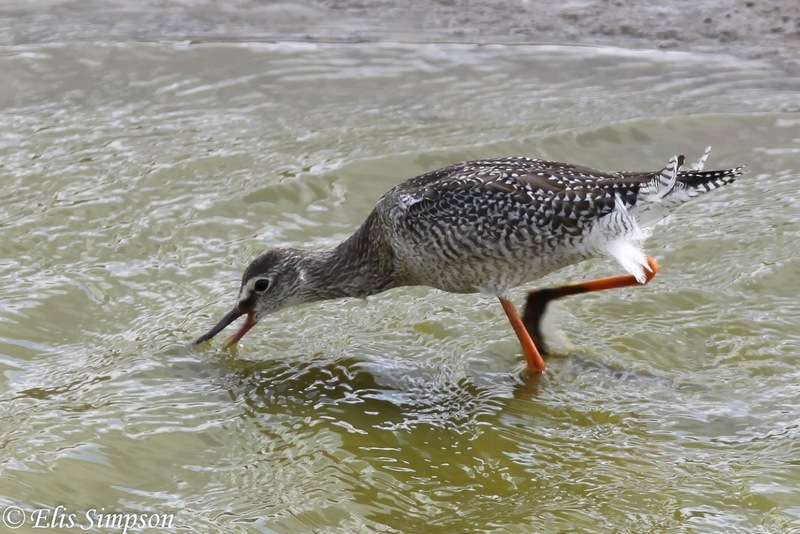 The Spotted Redshank breeds in northern Scandinavia and across Arctic Russia. The wintering quarters are across sub-Saharan Africa north of the equator for the most part, sporadically around the Mediterranean across Asia to South-East Asia. Spotted Redshank Tringa erythropus; Titchwell, Norfolk, England. June 2012. It is a slim and elegant bird with a very striking white-spotted, dark grey or black breeding plumage, the females are slightly less black than the males. The bill is mainly black but the basal half of the lower mandible is red or orange. In this plumage it is unmistakeable. In winter they look much more like the Common Redshank and care must be taken to identify them. 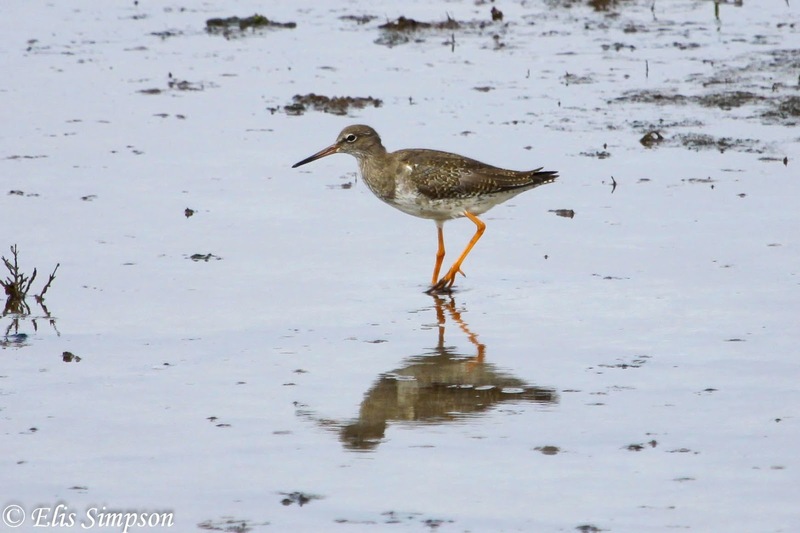 They have white underparts and a light grey back similar to Common Redshank, but the bill is longer and thinner and has a slight droop at the tip and the legs are longer. They also show a distinct white supercilium especially in front of the eye creating a distinct dark eye line. Non-breeding Spotted Redshank Tringa erythropus; Laempakbia, Phetchaburi, Thailand. January 2014. Non-breeding Spotted Redshank Tringa erythropus; Titchwell, Norfolk, England. September 2012. Juveniles can be distinguished by their barred underparts. Juvenile Spotted Redshank Tringa erythropus; Titchwell, Norfolk, England. August 2011. 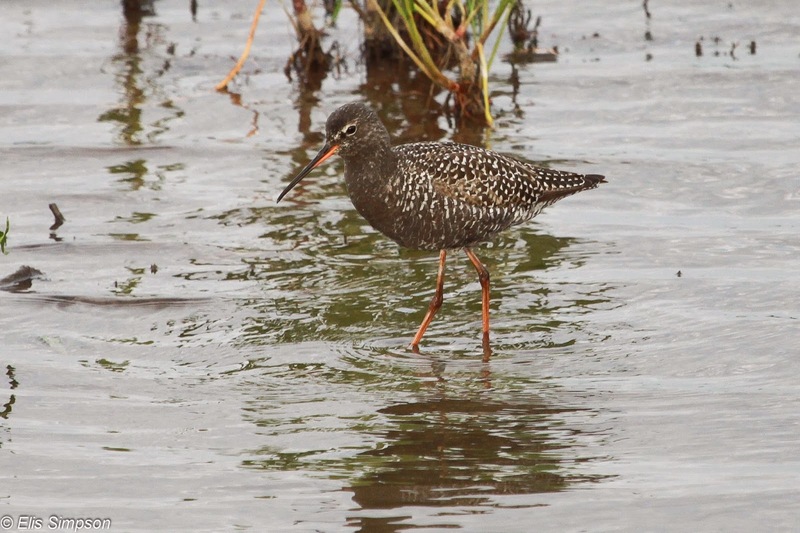 The Common Redshank is a smaller, less elegant and striking looking version of the Spotted Redshank with a heavier, shorter bill which is red or orange on both the upper and lower mandible. There are six subspecies spread across from Iceland in the west to China in the east. In breeding plumage these birds are brown above and white below with varying degrees of dark spotting especially on the underparts. Breeding Common Redshank Tringa totanus; Titchwell, Norfolk, England. June 2013. In winter the underparts are white and unmarked and the upperparts plain brown. Non-breeding Common Redshank Tringa totanus; Laempakbia, Phetchaburi, Thailand. November 2013. The juvenile can be distinguished by the notching and fringing on the upperparts. First winter Common Redshank Tringa totanus; this bird has almost lost its juvenile spotted back but retains the wing coverts and tertials. The Common Greenshank is very much an old world species that unlike the previous two species penetrates well into the southern hemisphere across most of southern Africa and Australia in the non-breeding season. It breeds from northern British Isles across Scandinavia and Russia to the Kamchatka peninsula in Russia. Non-breeding Common Greenshank Tringa nebularia; Pak Thale, Phetchaburi, Thailand. January 2014. In breeding plumage they have very streaky head, neck and chest but in winter the streaking is confined to the back of the neck and crown. Non-breeding Common Greenshank Tringa nebularia; Kotu, Western Division, The Gambia. January 2014. Juvenile birds are slightly browner on the back and have pale fringed upperpart feathering wu=ith a dar subterminal bar. The pale fringing can be creamy instead of white. Common Greenshanks Tringa nebularia; The bird on the right has retained some adult breeding streaking on the breast, the centre bird has the dark subterminal with pale fringes of a juvenile and the left bird appears to be a non-breeding adult. Nordmann's Greenshank is the rarest of our selection being Endangered according to BirdLife International. The population is less than 1,000 mature individuals according to recent surveys and the population as a whole is declining rapidly due mainly to habitat loss where tidal areas are being turned over to industry and agriculture. Nordmann's Greenshank Tringa guttifer and Spotted Redshank Tringa erythropus; Laempakbia, Phetchaburi, Thailand. January 2014. In breeding plumage they are heavily spotted around the head and neck which gives them their alternative name of Spotted Greenshank. One of the features that distinguish this species given good views is the line between the upper and lower mandibles being slightly curved producing a 'smiling' effect. Nordmann's Greenshank Tringa guttifer; Laempakbia, Phetchaburi, Thailand. January 2014. The bi-coloured yellowish bill with a dark tip and the yellow legs are other pointers to this bird's successful identification. Nordmann's Greenshank Tringa guttifer (with Grey Plover Pluvialis squatarola in foreground); Laempakbia, Phetchaburi, Thailand. January 2014. To finish, Spotted Redshanks (see the kink at the end of the bill?) against a Thai sunset, one of Elis' masterpieces.